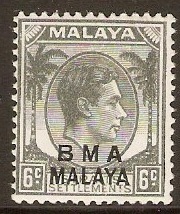 Malaya (BMA) 1945 1c Black. SG1a. Unmounted mint 1945 1c Black. SG1a. King George VI definitive stamp with overprint. 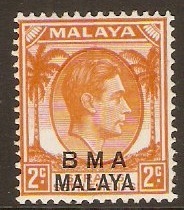 Malaya (BMA) 1945 2c Orange. SG2. Mounted mint 1945 2c Orange. SG2. Chalk surfaced paper. King George VI definitive stamp with overprint. Unmounted mint 1945 2c Orange. SG2. Die II. 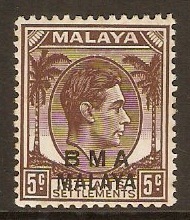 King George VI definitive stamp with overprint. 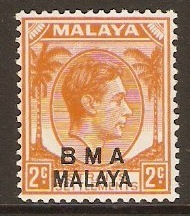 Malaya (BMA) 1945 2c Orange. SG3. Unmounted mint 1945 2c Orange. SG3. Ordinary paper. King George VI definitive stamp with overprint. 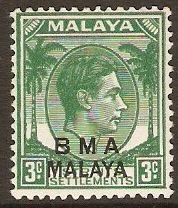 Malaya (BMA) 1945 3c Blue-green. SG4b. Heavy mounted mint 1945 3c Blue-green. SG4b. Chalk surfaced paper. King George VI definitive stamp with overprint. Unmounted mint 1945 3c Blue-green. SG4b. Chalk surfaced paper. 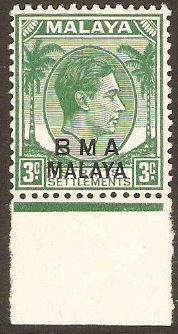 King George VI definitive stamp with overprint and sheet margin. 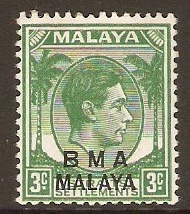 Malaya (BMA) 1945 3c Yellow-green. SG4. Mounted mint 1945 3c Yellow-green. SG4. Ordinary paper. 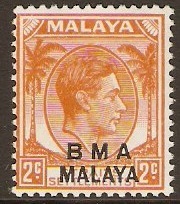 King George VI definitive stamp with overprint. 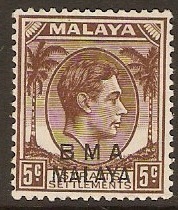 Malaya (BMA) 1945 5c Brown. SG5. Mounted mint 1945 5c Brown. SG5. Chalk surfaced paper. King George VI definitive stamp with overprint. Unmounted mint 1945 5c Brown. SG5. Chalk surfaced paper. King George VI definitive stamp with overprint. 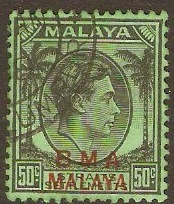 Malaya (BMA) 1945 6c Grey. SG6. Mounted mint 1945 6c Grey. SG6. Chalk surfaced paper. 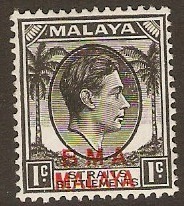 King George VI definitive stamp with overprint.